Now a decade after Mbembe’s groundbreaking work, the recently published collection of essays titled Queer Necropolitics takes up similar questions, this time with a queer slant; that is, it maintains a clear investment in “queering the necropolitical and of interrogating claims to queerness in the face of death, both spectacular and banal” (2). Co-edited by Jin Haritaworn, Adi Kuntsman, and Silvia Posocco, this timely volume provides a new framework for analyzing life and death in an ever-increasingly neoliberal environment that folds in some previously othered others while marking other others for social exclusion and extinction. It actively draws upon queer theory, gender studies, social movement theory, critical race studies, postcolonial theory, legal studies, sociology, and media studies, and stands to make significant contributions to these fields in its own right. In their engagement with the politics of life and death, Haritaworn, Kuntsman, and Posocco are, like Mbembe, clearly invested in asking who gets to live and who must die (or who must live and who is let die), but they push this even further. While approaching this question through a queer lens might suggest to some a narrowing of focus, the collection effectively opens up the field of inquiry to more possibilities, both critical and speculative. The co-editors summarize both the stakes and the timeliness of this work’s emergence: “This book comes at a time of growing interest in the necropolitical as a tool to make sense of the symbiotic co-presence of life and death, manifested ever more clearly in the cleavages between rich and poor, citizens and non-citizens (and those who can be stripped of citizenship); the culturally, morally, economically valuable and the pathological; queer subjects invited into life and queerly abjected populations marked for death” (2). Certain (queer) bodies are cultivated for life and (re)production, while others are marked for death or are let die, constructing a dangerous line between legitimate subjects and illegitimate non-subjects. As this volume makes clear, among these “non-subjects” are, in particular, queer and trans people of color who experience racism, homophobia, and transphobia along with other forms of oppression and subjection, including xenophobia, sexism, poverty, ableism, and criminalization. In their introduction to the collection, Haritaworn, Kuntsman, and Posocco lay out how the concept of necropolitics can be taken up in order to examine the acceleration of premature death “for those who are unassimilable into liberal regimes of rights and representation and thus become disposable” (1). In this sense, the volume positions itself in relation to growing debates on the place of rights discourses, which, although late-coming to LGBT politics, have become formative of notions of “progress” and “progressiveness.” Similarly, the text makes a statement on liberal gay politics’ lack of engagement with coloniality and related questions around militarization, securitization, and incarceration. Indeed, many contributors (e.g., Sarah Lamble, Sima Shakhsari, Morgan Bassichis and Dean Spade) show how queer complicities are central to neoliberal regimes of productivity and LGBT-related legislation. Despite its professed focus on both the spectacular and the banal, Queer Necropolitics maintains a particular attachment to uncovering everyday death worlds, daily practices that result in the exhaustion and diminishment of certain populations. Tensions between inclusion and exclusion are also central to the volume, with a clear warning made by the editors early on: inclusion itself can be a deadly endeavor. Many essays in the volume (particularly chapters by Aren Aizura, Elijah Adiv Edelman, and Jason Ritchie) attempt to respond to this notion of deadly inclusion as evoked in a question posed in the introduction: “If modern genders and sexualities (both dominant and subordinate) have been formed against constitutive Others whose primitivity is signified as perversity – and as a failure to perform proper gender binaries – what is at stake in seeing inclusion through or into these identities?” (3-4). Here, citizenship and border control (both physical and symbolic), particularly under conditions of settler colonialism and occupation, become key thematics that undergird many of the volume’s essays. Queer necropolitics, then, serves as both a theoretical point of departure and “a concept-metaphor that illuminates and connects a range of spectacular and mundane forms of killing and ‘letting die’ while simultaneously radically reimagining the meanings, purchase and stakes inherent in ‘queerness’ as a category of analysis and critique” (4). The book as a whole also takes inspiration from Orlando Patterson (1982) and Lauren Berlant (2007) and their respective theoretical interventions. Patterson’s “social death,” formulated in relationship to slavery, is a process of alienation and exclusion of the slave from the community, and relies on a suspension of personhood and belonging, whether through institutions like law or social structures like rituals and symbols. Berlant’s “slow death” refers to “the physical wearing out of a population and the deterioration of people in that population that is very nearly a defining condition of their experience and historical existence” (754). Together, they provide a helpful theoretical framework that highlights the importance of combining historical perspectives with analyses of present-day neoliberal policies that drain social resources and further marginalize precarious populations. A preface by Sunera Thobani sets a rigorous and critical tone that forces an acknowledgement of the fact that “sovereignty is not abstract. It has a particular name, a face, an address, a geographical coordinate. Its face is white, it remains housed in white bodies, it is located in Westernity” (xvii). Indeed, as Thobani rightly signals, Queer Necropolitics intervenes by pointing out “the deadly workings of power” (xviii) in this racist and imperialist order. Throughout the collection, a variety of geopolitical locations are closely analyzed, including Iran, the United States, Guatemala, the United Kingdom, the Philippines, Palestine and Israel. Methodologically, the volume is also rich, as contributors make use of ethnography and auto-ethnography, empirical fieldwork, film and visual analysis, textual analysis, and archival research, amongst others, to formulate larger arguments. The edited volume’s nine essays are divided into three sub-sections, with the first entitled “Death Worlds.” This notion of “death worlds” again takes us back to Mbembe, who puts forth the concept of necropolitics and necropower “to account for the various ways in which, in our contemporary world, weapons are deployed in the interest of maximum destruction of persons and the creating of death-worlds, new and unique forms of social existence in which vast populations are subjected to conditions of life conferring upon them the status of living dead” (Mbembe 2003: 40). “Death worlds” refer to not only physical death but also to social and political death. In these first three chapters (Che Gossett on AIDS criminalization and black radicalism, Michelle Martin-Baron on US military funerals and masculinity, and Silvia Posocco on transnational adoption circuits), this opening section also calls up previously mentioned social death and slow death, each chapter offering a view into the making of death worlds and their vitalities and ontologies. From the making of death worlds, the collection moves to the second section, “Wars and Borderzones,” which, as its title suggests, focuses on violence, spatiality, and movement. Mobility and containment become key vectors of analysis in these chapters that draw on an assortment of cultural artifacts, including Sima Shakhsari’s examination of the figure of the Iranian transgender refugee in Western media, Jason Ritchie’s analysis of Israeli representations of Palestinian queers, and Aren Aizura’s putting forth of the notion of “trans necropolitics” through a critical reading of three recent films. Each of these chapters adds to a forerunning discussion of how the “seductive erotics of war are precisely what facilitate the necropolitical distinction between queers destined for life and those discarded for death” (13). The final section, “Incarceration,” is invested in uncovering how (queer) complicities are also intimately tied to necropolitics. Not only are prisons “key sites for the vitalization of queer identities” (16), but punitiveness has also become the mark of “gay-friendly” societies that map homophobic attitudes onto specific communities constructed as “backwards.” This point is eloquently made in Sarah Lamble’s chapter, which examines how hate crime laws belie queer investments in punishment and sexual citizenship. Puar’s work (2007) certainly seems a necessary precursor to many points made in this section, with homonationalism proving a helpful concept to evaluate mainstream LGBT politics’ bolstering of state practices that target racialized and religious others (e.g., ‘war on terror’). In the following chapter on the criminalizaion of trans feminine bodies of color in Washington, DC, Elijah Adiv Edelman takes this a step further with the concept of “homonecronationalism,” a timely intervention that highlights “how the technology of letting live and letting die functions to serve and promote homonationalist projects in the reproduction of viable queer citizens (e.g., those fulfilling the requirements of homonormative ideological reproductivity) from those otherwise considered included within LGBT rights paradigms” (175). The volume appropriately closes with Morgan Bassichis and Dean Spade’s chapter, which argues that the American project is built upon anti-blackness and that non-black queers uphold these violent racist and imperialist ideals, partially through pursuits of (the fantasy of) formal legal equality. While there exists a large body of post-Foucault work on biopolitics – and now as well abundant scholarship on necropolitics thanks to Mbembe’s more recent study – this collection is particularly innovative in its queer take on the topic. One point that could be overlooked but is worth highlighting is the editors’ brief noting of the “worrying tendency to dismiss queer and trans of colour critiques in particular as identitarian, pre-theoretical and inferior” (4). Indeed, this is, in fact, one of the key contributions that this volume makes to a body of scholarship that, quite worryingly, becomes more and more skeptical of research about – and from the perspective of – marginalized genders and sexualities, particularly those of color. Dismissing such work as essentialist or identity-political is a cop-out to examining the ways in which discrimination and oppression shape processes of subjectivation and academic inquiry. In this sense, the editors’ active solicitation of contributions by gender non-conforming authors and on trans-related topics should be taken as an important political statement and scholarly intervention. 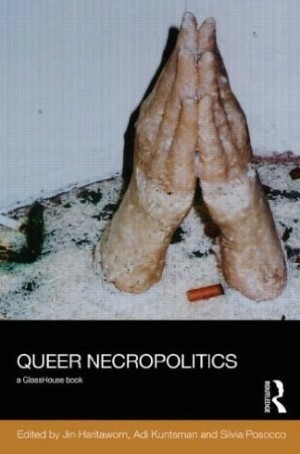 Queer Necropolitics is poised to make a notable contribution to ongoing discussions of biopolitics and necropolitics – of life and death – offering an intervention into topics ranging from AIDS activism to transnational adoption, from military funerals to the prison industrial complex, from homonationalism to necronationalism. All in all, co-editors Haritaworn, Kuntsman, and Posocco – along with each of the chapter authors – make a much-needed intervention that furthers discussions of queer vitalities and ascendancies, particularly the idea that some queers rise and are accorded rights on the backs of racialized queer others. On the whole, the following questions posed in the introduction haunt each of the essays: “What new techniques of governance can be mapped in a context of power which increasingly speaks the language of women’s, gay and transgender rights, protection and diversity? What challenges arise from these complicities and convergences, and how are they best addressed?” (1). Indeed, these questions may necessarily go unanswered, but they must continue to be posed, over and over again. Berlant, Lauren. “Slow Death (Sovereignty, Obesity, Lateral Agency).” Critical Inquiry 33 (2007): 754-780. Print. Mbembe, Achille. “Necropolitics.” Public Culture. 15:1 (2003): 11-40. Print. Puar, Jasbir. Terrorist Assemblages: Homonationalism in Queer Times. Durham, NC: Duke University Press, 2007. Print. Christine Quinan is Assistant Professor of Gender Studies in the Department of Media and Culture Studies at Utrecht University. Christine’s teaching and research interests include postcolonial studies, trans studies, queer theory, and feminist/queer pedagogy.